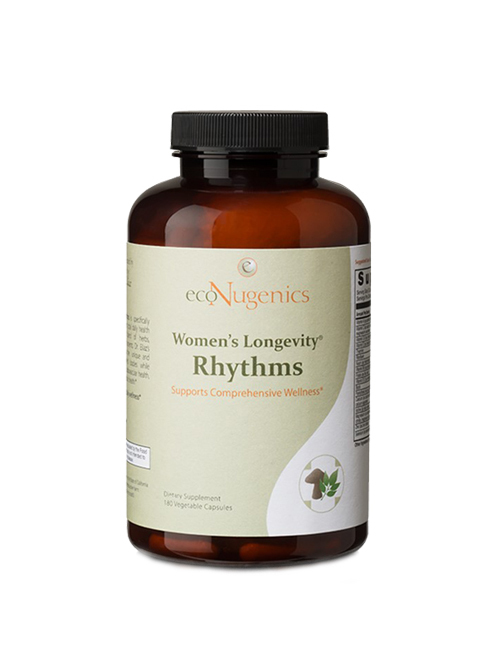 Women’s Longevity® Rhythms Supports Comprehensive Wellness for Women, containing a multi-nutrient and herbal formula designed to meet the daily nutritional requirements of women up to the menopausal stage. 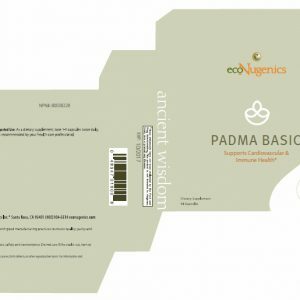 More than a basic multi-vitamin, this integrative formula is a comprehensive blend of 37 herbs, vitamins, minerals and antioxidants. 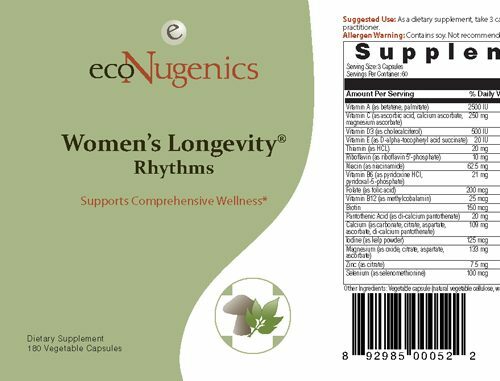 When used daily, this unique herbal-nutrient blend offers support for the natural rhythms of a woman’s body, while promoting cardiovascular health, metabolic balance and healthy bones. 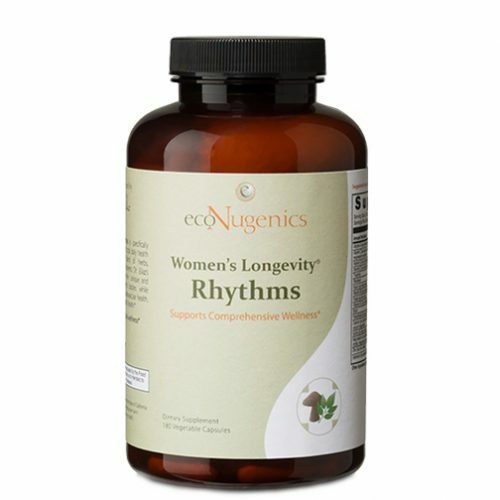 UNIQUE FORMULA DESIGN: Women’s Longevity® Rhythms is based on a combination of essential vitamins and minerals necessary to support the nutritional demands of women today. 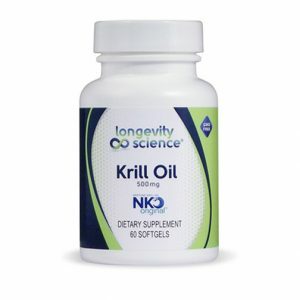 Vitality, Metabolic and Endocrine Support Blend – Includes alfalfa leaf, eluthero root, royal jelly and medicinal mushrooms; along with chaste tree, blue cohosh and licorice root extracts. Royal jelly, together with chaste tree, blue cohosh and licorice extracts, helps maintain healthy hormone balance in reproductive-age women. Medicinal mushrooms, eluthero root and royal jelly are shown to enhance vital energy and overall health, while alfalfa leaf provides mineral and nutrient support for healthy estrogen levels and healthy bones. Detox and Liver Support Blend & Antioxidant Blend – Includes peony root and burdock root extracts, together with the nutrients choline and L-taurine. Peony and burdock root have been used for centuries by traditional herbalists to support liver health and promote gentle detoxification. Choline is a nutrient which demonstrates a number of health benefits, particularly in supporting liver health. 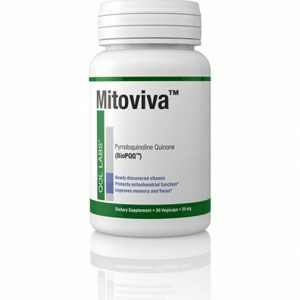 L-taurine is an amino acid which is important in the formation of bile for liver health and gentle detoxification. Promotes Stamina and Energy, Helps Reduce Fatigue – Zinc supplementation may help restore and sustain balanced energy throughout the day. Medicinal mushrooms, L-taurine and royal jelly have been shown to support physical endurance by supporting metabolism and protecting muscle tissue. 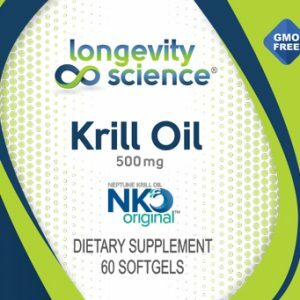 THE BEST Manufacturing and Quality Control Our Longevity® Formulas are 100% vegetarian, allergen and gluten free, and contain no artificial flavors, preservatives or colors. All of ecoNugenics supplements are manufactured in a manner that meets or exceeds the current Good Manufacturing Practices (GMP) guidelines, as outlined by the Food and Drug Administration (FDA).